SISCC is funded to strengthen the evidence-base for large-scale sustainable change working with universities and health and social care organisations across Scotland. Safer prescribing in primary care - evaluation of an informatics tool and role of community pharmacists in polypharmacy reviews. At the end of 2017, we began to engage with practitioners and academics to influence the design of our 2018-19 work programme and held a call for proposals from 3rd January 2018 - 31st March 2018. Strengthen the evidence base for improving quality of care, and delivering better quality outcomes including staff and service user experience. Disseminate the improvement science knowledge base to practitioners and decision-makers. Facilitate translation of improvement knowledge into improvement activity, practice and policy. Build engagement, capacity and capability across a network of researchers, practitioners and policymakers, helping to create, disseminate and apply improvement knowledge, to support widespread improvement in Scotland's health and care. Define new approaches to improvement methodology including data analysis. Evidence the changes in and impact of the improvements in quality of care delivered by the project. The maximum funding available for new proposals is £35,000 and had to be completed within a 12 month timeframe. Under this specific call for the 2018/19 Work Programme - there were two routes to submission: Outline Proposal (expression of an idea) or fully-costed Research Proposal. The aim of the Outline Proposal stage was to provide an opportunity for practitioners in health and social care to work with the SISCC Executive Group to develop their idea or challenge into a fully costed Research Proposal. The Outline Proposal Form and Research Proposal Form are available at the end of this webpage. All research proposals submitted by the 31st March 2018 were reviewed and prioritised by the SISCC Executive Group before the end of April 2018. 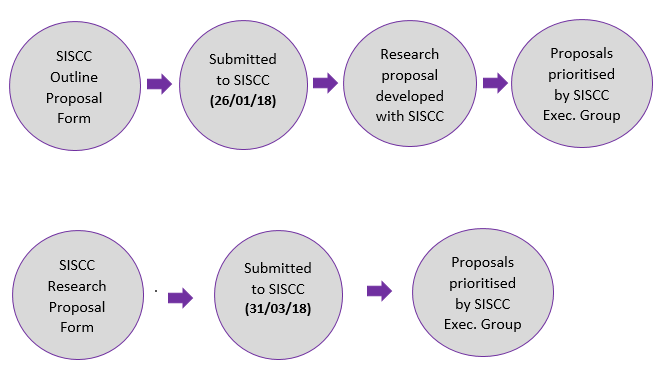 Proposals were assessed against the SISCC funding objectives and prioritisation criteria above and prioritised accordingly for review by the SISCC Strategic Steering Group. If you would like any more information about the 2018/19 process please contact Dr Nicola Gray, Associate Director (Programmes & Evaluation) or Julie Anderson, Associate Director (Partnerships & Engagement) on 01382 388527.